After waiting a few days for some easterly winds to pass, she was launched on the afternoon of 19 April 2016, about 11 miles off the coast of Indian River Inlet but, unfortunately, the easterlies came up again a few days later and she washed ashore on Assateague Island in the Chincoteague National Wildlife Refuge. The rangers found it in perfect shape. She was relaunched well offshore a few weeks after her first voyage (5 May) off a vessel called the “Bermuda Islander”. 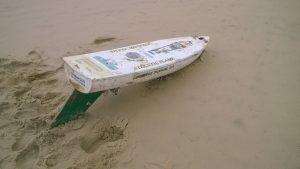 After traveling nearly across the ocean, the transmitter stopped reporting on 27 March 2017 but several months later, on 18 September, an email came in from Jean-Bernard DUPRAT from France who discovered the boat ashore on a sandy beach “sur la plage entre Mimizan et Contis” with pics included. 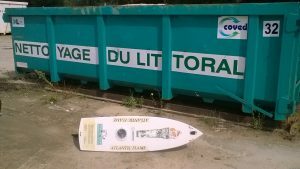 The next day, Jean-Bernard rescued the boat from the beach clean-up crew. 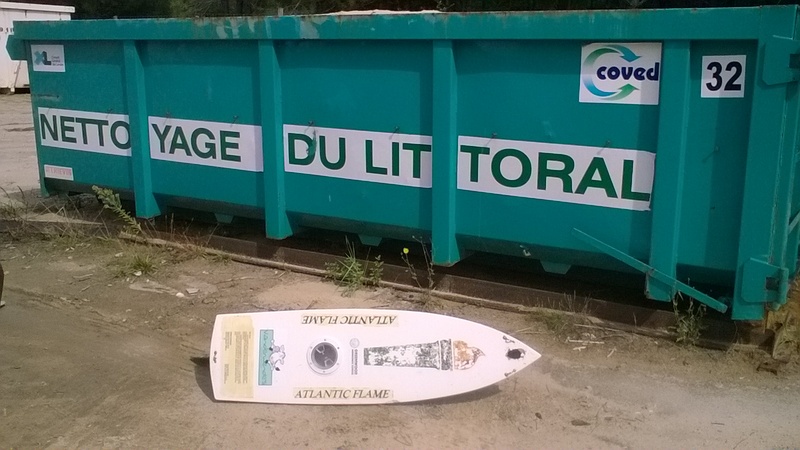 We received word that our little boat is now on display at a school in Mimizan, France. It is great to see her cleaned up and on display! T he Greenwood Mennonite School (GMS) in Delaware built a miniboat as a part of Duane Miller’s high school J-Term class. Ten young men participated in the building and have named it the Atlantic Flame. 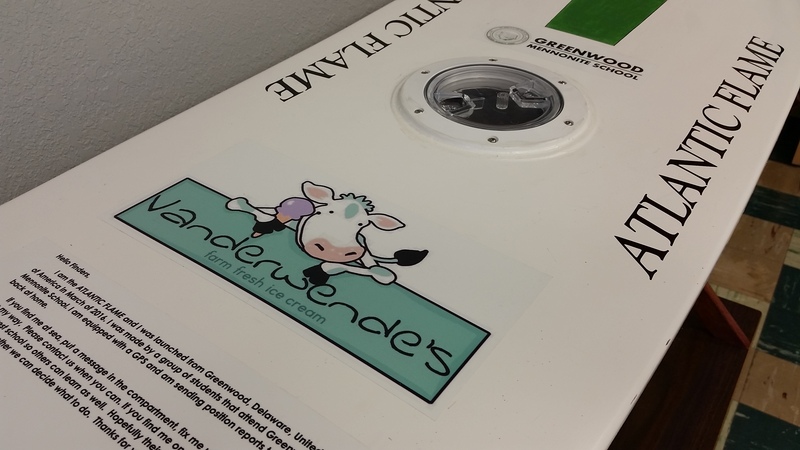 It is sponsored by their local Vanderwende Farm Creamery. On her voyage, the students hope that Atlantic Flame will travel to distant lands and that she will be taken to a local school so the educational aspect of the project can continue there. 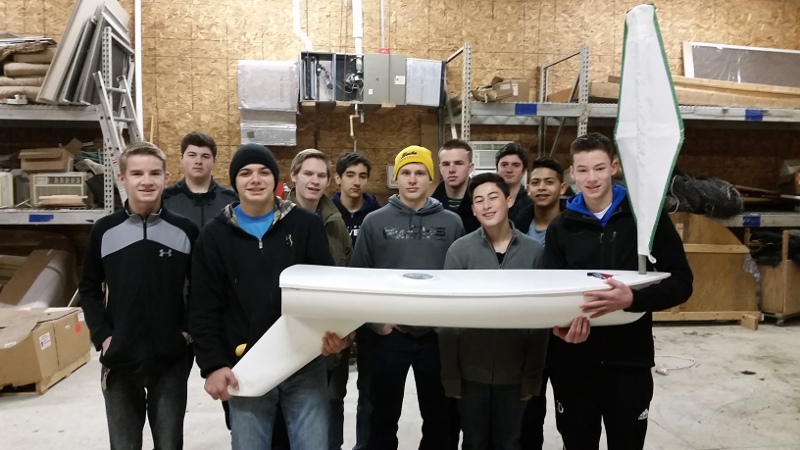 With this in mind GMS students have placed several items in the sealed hold of the boat such as a paper on which each of Jterm student have had a chance to write their names, several GMS items, and some U.S. coins as well as description of the project. GMS students will print this description in the different languages of the countries where the boat might land. These include English, French, Welsh, Spanish, Finnish, and others. Follow the Atlantic Flame on Facebook for more updates!